I have been to restaurants similar to Genghis Grill and I usually have to wait in line at the grill while they cook my food. Sometimes the line can get long and I end up waiting for awhile in-between hungry restaurant goers. Genghis Grill is different! I dropped off my bowl at the grill, the cooks took down my name and any preferences, I sat down at my table and then the cooks brought out my dish right to me! This takes the long line waiting period out and I was able to relax and enjoy my dining experience! Once my food arrived at my table, I took the first bite and I my taste buds were screaming for more! I ate slowly so that I could fully enjoy each and every bite! Maybe I am a master at choosing spices and sauces (maybe not). Instead, I believe that Genghis Grill has quality food and any spice and sauce combination is good there! Even though I wasn’t terribly hungry after my meal, I couldn’t help but notice the dessert menu and I couldn’t resist the Cookie Butter Crispy Wontons dessert. 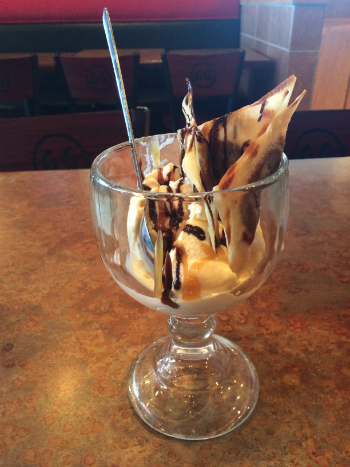 According to their menu, this dessert is “seared wontons, stuffed with cookie butter, served fresh off the grill with creamy vanilla ice cream and chocolate sauce.” Pause and re-read that description. Wow! Cookie butter is one of my weaknesses so I indulged. It was truly sensational! I couldn’t finish the entire dessert, but I made a valiant effort. 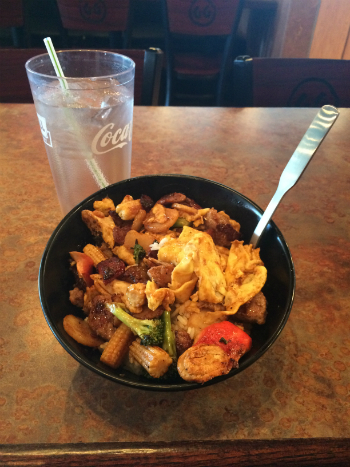 In summation, Genghis Grill is a great place to eat and Springhurst is an even greater place to live!